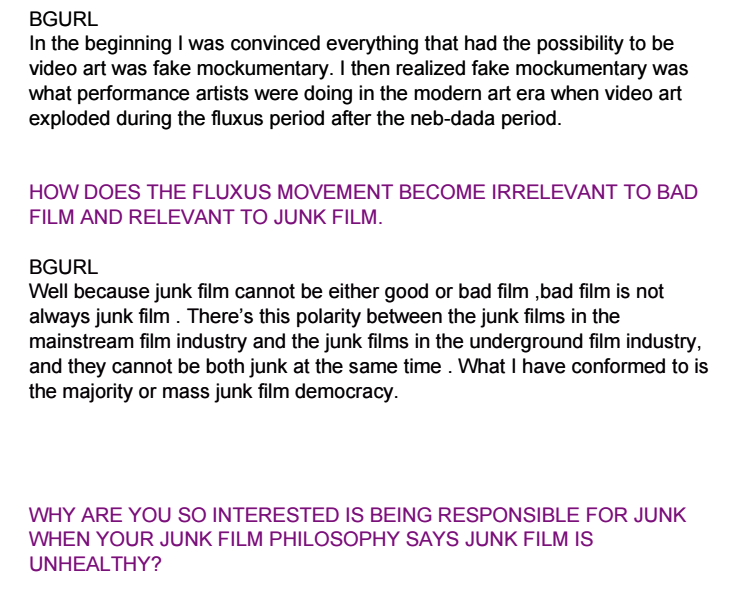 Social theory can preoccupy the anti art art film aesthetic as the junk film’s role upon intellectualizing the junk film aesthetic literally according to the junk film manifesto (read junk film manifesto). 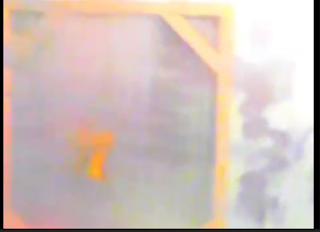 When comparing the heterogeneous nature of the returning video it is now a junk film synthesis of non convention. 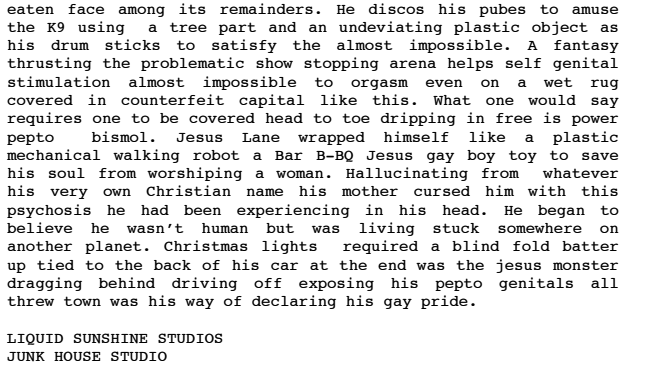 The fake mockumentary manifesto is labeled in a manifesto name that can provoke questions on such methods upon the non objective film composition or non representational elemental design of a film with either a movie absence but not without avant guard film history or mockumentary deconstruction like the acid film (read acid film manifesto). Subsequently a social and cultural reform is demonstrated for such mock documentary based works maintaining a pretense of reality opposed to institutionalized film that follows a script. On the one hand, it is more directly inscribed blurring the lines of theses circuits as a communicative tool with which ever ideology does this anti beauty explanation for other cinematic representations apart from plot or story from movie conventions. Named in the junk film aesthetic are such as instructional video and computer screen recordings, both stylized documentray. 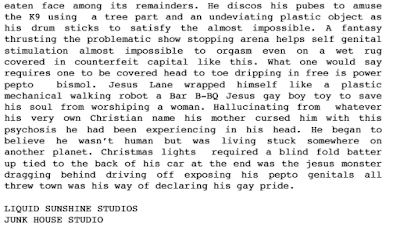 Neo punk cinema innovations reveal the close and conflictual contemporary exploitation of such film trends among socialist feminism depicting interpretation to be compartmentalized but too new for film genre during the boom era of Pink 8 style guerrilla film manifestos according to its digital and analogue film artifact type. (read pink 8 manifesto) That of unhealthy aims to continge film structure without film form by not settling for continuity. 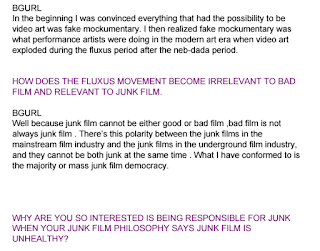 Anti art art film references the junk film aesthetic in particular according to the Pink 8 manifesto maintaining the feature film and objection to revitalizing the HD reputation outside the fake mockumentary manifesto that is also a Pink 8 style. To exist as justification for film genre not to be taken over by mockumentary the way documentary has taken over the mockumentary selection. DON'T KEEP STARING OR FOXY WILL POOP CORN ROBOTS AT NITE ON YO CRACK POP! 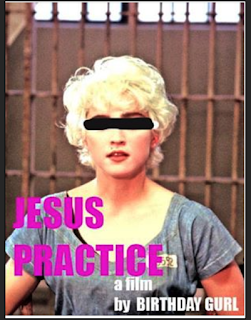 A deconstructed film with thought provoking questions like “What new drug is she on?And is this art film? Fast in a blurry self-awakening, debauchery in cyber space where extraterrestrial hypnosis is convincing her that Foxy is her fake Internet existence. 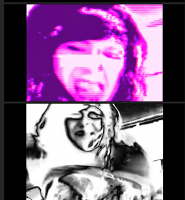 In this reoccurring dream webcams surround her alienated life. In her dressing room, personal steam room, and at her local grocery store.... Hidden video callers follow her from the unknown. Three main objectives are her only alternative to address this webcam addiction for survival(1) Chain-smoking, (2) two-way mirror gazing(3) Video moaning. 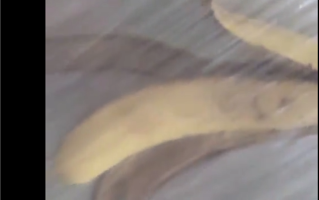 WITH THE OMNI-PRESENSE of technology in human life and of its possible dangers: as psychical alienation and losing our freedom through digitalization and letting the technology overmaster us it’s necessary to "humanize" technology in an anthropological way and to overcome it by not rejecting this fake mockumentary junk film. 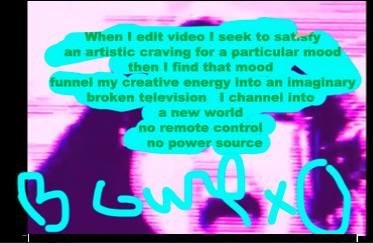 This, questionable two-way rendezvous happening on the camera’s other cyber side is a surreal webcam addict’s abduction by extraterestrial hypnosis. 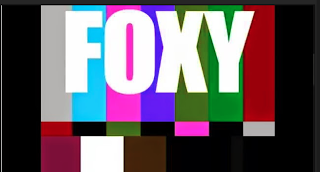 FOXY's subconscious records her video calls to later play back a cyber fantasy of tantalizing behaviors that haunt her just as much as an e-rotten banana. 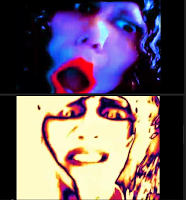 Foxy the Night Rocker is chased by a nightmare of paranoia built up by her delusions of grandeur where living a life preoccupied by insanity from staring back at herself into a two -way mirror at all hours is keeping her busy video moaning. The treatment includes one major phase: (1) An online conversion of the video moans streaming into the databases of auditory noise experiments to objectify her video callers request of night time activities using a plastic toy Tiara, a pack of smokes, and lipstick. This fake mockumentary junk film shows the video artist improvising an unintended act of body endurance where she maintains a pretense of reality. In a dance of chatty,pantomime and head drama that displays mock performance it is blurring the lines between performance art and acting to break free from narrative. 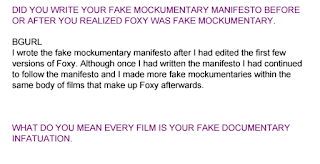 Dexter Mock Duck: Ms. Robles explain to us how you have unearthed fake mockumentary inspired by Fabrizios pink 8 film manifesto? Laura Grace Robles: :A similar philosophy is shared in both his and my Pink 8 film manifestos. 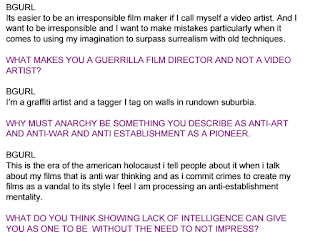 Both paying respect to the DIY punk mentality to anarchistic views so that Pink 8 cannot be learned in film school particularly for those film makers lacking resources with a drive to become film makers even if they don’t have a camera as i once did not. Like the Pink 8 ideology and its regards to perfection, when film mistakes are allowed there is no other perfection to me. To make video art part of the experimental film hybrid that allows my films to to be possessed by an aim to fail by making films that break boundaries the way Fabrizio and I understand continuity is wrong. Dexter Mock Duck: Who is your competition? 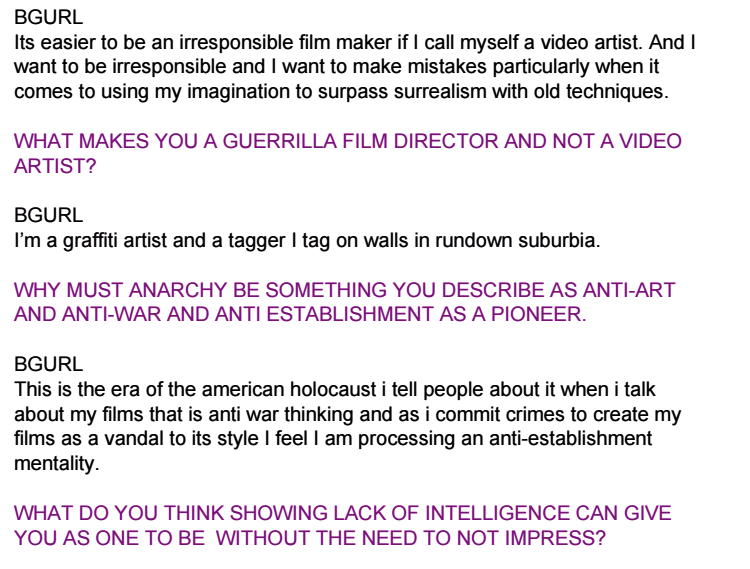 Laura Grace Robles: At the heart of punk cinema anarchistic ways I don’t compete to make films better than one or the other. 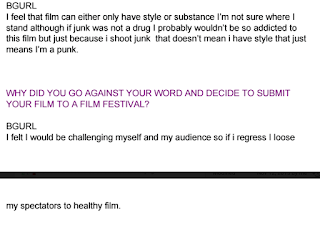 They are just different, I don’t make films to compete with other critics besides my own judgement, so i guess i compete with myself. Because punk is free from the unfortunate souls who believe there is no hope for understanding life as the individual who thinks apart from the normality of expectation and predictability to think this way humbles my imagination and that allows me to work and think with less tricks and more sincerity. Dexter Mock Duck: How has your style evolved ? Laura Grace Robles: Only a street super star could elevate the hope for an uneducated commoner to be one capable of blurring the lines between acting and performance art as a mock performer like the fake actors in some of my films but that now also specifies under feature film making not just short films as i was used to making. Now an opportunity that could be explored faithfully though commitment may fullfill either the Pink 8 style by facing a new manifesto only in the same represented junk film aesthetic in a body of epic films. Dexter Mock Duck:How are you confronted by film language? Laura Grace Robles:Film language must be responsible for knowing more than they must need to know about film itself other than the film's limits that have influenced them to posses some skill to make the right mistakes that will label style. Every film is not meant to be memorable if its not politically incorrect film in some conversation. So I feel pressured to rely on each film on one another to find justification for what I have not yet finished speaking about in the conversation, Its not a junk film yet and thats not easy to avoid wether your intention is to make a junk film or post some random movie file on youtube and as long as its not telling a story, the film is to have options that limit and challenge the DIY film maker allowing their words to be the better or worse more together useful or uselessness in the same foundation for film making techniques so I can't fail. 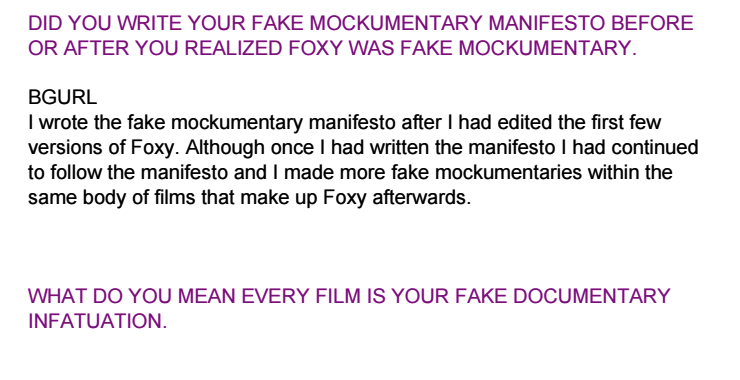 Dexter Mock Duck: What is a fake mockumentary to you in one word? 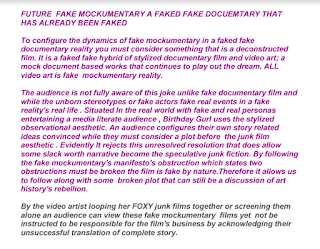 Laura Grace Robles:A fake mockumentary is a dream. Dexter Mock Duck: How does a Pink 8 style challenge your conventional techniques? Laura Grace Robles: A Pink 8 style endorses an alternative to a script by using the mock document which is,challenging. Flawed archetypes are the street super stars or inexperienced actors the fake actors who must not be aware so that they may feel as though they can blur the lines between acting unaware and aware of their reality of there artistic performance. In the swamp the offense is organized by guerrilla film makers and street artists allowing the junk film aesthetic to be apart of short film and silent film as well as the no budget and non narrative film. Possibly there is hope for developing a form of counterfeit film, imitation film that imitates its original state but cannot be the real story or narrative without a story. in the anti-art art film gere that is too new to be genre an anti-war and anti-establishment distributing government corruprton as the anarchy surviving dystopia.